There have been so many overhead isometric action games over the years that it’s easy to lose count and take new releases for granted. Varying wildly in quality, from gems like Diablo 3 to mixed experiences like Dead Nation, I could easily run out of hands counting how many of those I’ve played over the last decade. So what could possibly come off as original or simply just worth spending the least bit of time with now? As you step into the shoes of former mercenary now monk Vasily, it becomes clear that Redeemer has its heart in the right place. It’s a brutal, bloody, merciless brawler that’s not exactly worried about being serious at all. Vasily is a skilled hand-to-hand fighter that’s seen enough of his previous employer’s antics, so after he’s attacked by his old friends years after crash landing in an isolated monastery, all bets are off in his quest for revenge. 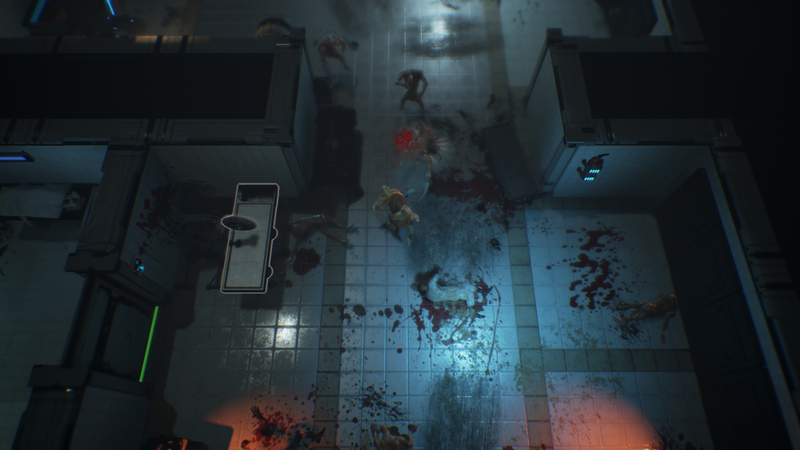 Starting off in the monastery that Vasily calls home and slowly making its way to the bowels of the evil corporation behind hideous scientific experiments, Redeemer doesn’t pull any punches when it comes to murdering you at the drop of a hat. Vasily can only take so much damage before going down for the count, and he can get outnumbered fast. He starts out bare handed, and for the majority of the game, his hands and feet are the only means of defending yourself. The few weapons that you do find don’t last too long, and the further you get into the game, it becomes imperative that you prioritize how you attack the host of different enemy types you come across, since some of them are impervious to normal attacks and are only susceptible to weapon damage. While it’s smart to mix punches and kicks in order to get some combos out, it’s even smarter to keep enemies in check by countering their attacks when they glow red. By timing these moves correctly, you’re able to land some free hits in, a skill that should quickly become your bread and butter the further you get into the game and start encountering some of the more faster-hitting, twitchy adversaries. There’s also the off chance you’re able to dispatch foes by using the environment, in most cases allowing you to take out a threat in just one hit. It doesn’t work for everyone, and in case you initiate one of these attacks while fighting off a big crowd, there’s a good chance you’ll be attacked without having a chance to defend yourself. That’s one of the trade offs you’ll face in Redeemer, the balance of whether or not you should go in for more stylish, cooler moves at the chance of losing some health, or stick to more common attacks that take longer to off fools but are otherwise safer to execute. Still, if you do lose health, you’re quickly able to regain it by eliminating the next opponent, DOOM (2016) style. It pays to keep an eye out for skull icons, since they indicate that an enemy is ready to be executed, which yields even more health back to Vasily. Redeemer does extremely well when it comes to serving you decent combat encounters, mixing up enemy types and forcing you to vary up your attacks in smarter ways, sometimes even awarding you for being patient and sneaky, stealth killing isolated foes in the hope of thinning out the herd in the inevitable brawl that shortly breaks out, even though all of these tend to take place in less than inspired levels. Most of Redeemer takes place in tight corridors divided by doors, with a few open rooms thrown in here and there, and for the most part, you’re usually able to see the indicators for the aforementioned counterattacks, but sometimes the action can get obstructed by level geometry and awkward camera angles. At those moments, Vasily and whoever he’s dealing blows to are highlighted in red, which would work out well if it weren’t for the inability to see if said enemy is preparing to attack him and thus vulnerable to a counter. The best alternative to avoiding this issue was to lure packs of enemies down to more open rooms and take care of them there, even though not all levels are designed in a way that allows for this to be pulled off. Even though I didn’t run into this issue often, the few times that it happened, I was forced to swallow my pride and restart at a checkpoint, being extra careful not to fall into the same situation again. For as much as one could argue that there’s not a whole lot going on for Redeemer other than its quick pace and gratuitous violence, there’s no arguing the fact that a brutal game like this works out extremely well in its simplicity. There’ s no message to be gotten from playing through this. It’s a straight to the point, balls to the wall action experience that’s all the better for it.